I thought I would do a post about the perfumes and body sprays I currently own since it is beauty related. I am not a huge fan of perfumes or scents in general because I think do not like very pungent or strong scents. I also think it can be overbearing considering there are usually scents in my shampoo, conditioner, body wash, and body lotion. Therefore, you can see my stash of perfumes and such is relatively small. The two bottles in the back are body sprays which I typically use after I get out of the shower for an all over scent. I keep these bottles next to my little plastic cup which holds my eyeliners and other pencils. These sit atop my plastic makeup drawers for easy access. The light lavender bottle is Bath and Body Works' Moonlight Path which is my favorite scent from them. The smell is light, powdery, and very romantic.... As you can see, I'm quite horrible at describing smells. I use this almost everyday because I use the shower gel in the same scent so this helps it linger. Though this has been getting frequent use for a few months, there is still a ton of product left so I'm not sure if I will repurchase. The Victoria Secret spray was a Christmas present I recently received and it's simply called "Pink With A Splash Sweet & Flirty". The scent is extremely sweet like that of candy. I think this will be a nice scent for spring or summer when I am outdoors more often. The three perfumes I own actually do not sit next to my body sprays because the plastic drawers are not sturdy enough for the heavy glass bottles. 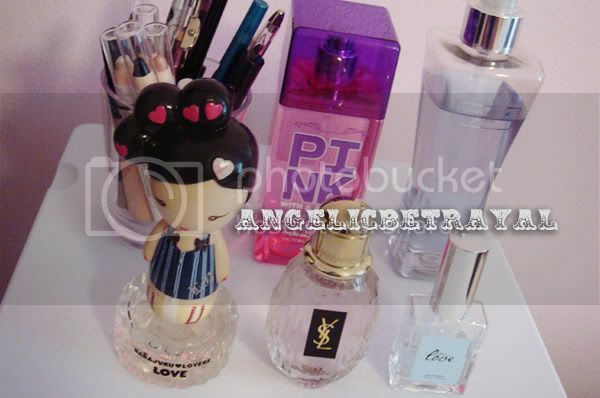 I keep the perfumes on another vanity but I changed their home for the sake of the picture :) The oldest of the three is Philosophy's Love which was a present from a friend a few years ago. The scent is undeniably sweet... a little too sweet for my taste. I do not reach for this often and I will not repurchase. The spray is also broken for some reason and a fine mist no longer jets out. I do spritz some of it onto my clothing sometimes just to give myself a hint of sweetness, especially in the spring. I bought the Harajuku Love (wow, just realized two of my perfumes are named "love") perfume primarily due to the cute packaging more than a year ago. After I purchased it I realized I was not very fond of the smell of it at all. I've used this a handful of times over the past year but recently this winter I realized this smells better throughout the day. Upon the first hour of wearing this perfume, the scent can be overbearing but it fades nicely into a more subtle and refined scent. Despite the extremely childish bottle, the scent actually smells very mature. It does not have a sweet smell but rather musky and thick. The perfume I was lusting after for more than a year and my newest addition to my vanity is YSL's Parisienne. I received a sample of this from Sephora more than a year ago and upon first whiff, I fell in love. However, I rarely use perfume and I could not justify spending money it. So I just carried on without it until a month ago my mom bought it for me as my early birthday present :) This perfume has an extremely unique scent that I cannot describe. I feel like a lot of perfumes smell similar and I do not like those scents at all but this is completely different. You really have to smell it for yourself! This has a light scent that is easy on the nose. I read a few complaints that it did not last long enough but it lasts the entire day for me. The bottle is also very classy and elegant but most fragrances are housed in unique bottles anyway. Again, I really like this for the colder months. In general I prefer perfume for wintry environments because strong scents are too much for me in the summer. I also keep a stash of mini perfume samples and such but I rarely reach for them unless I am going on a trip. I keep mini samples in my everyday makeup pouch if I feel like spritzing on something throughout the day. So that's my humble collection of fragrances :D What's your favorite perfume? Any recommendations? I use to not be a perfume kinda gal but my BF kinda got me into it, aww you don't like the HL "LOVE" that has to be one of my go to and favorites!